I may tow with this one some. How do the air bags compare to regular springs tongue weight wise? My understanding is that the airbag system is the one you'd want for towing. Levels out the car and will support as much as the available Class 3 hitch will pull. That pretty much what I have been finding since I posted that. Seems the air suspension is desired for towing on the x5's. No experience towing with it, but I've read the same as above. What I have liked is self leveling while carrying heavy loads. Comes in handy when carrying sand bags or roofing singles. It struck me as funny to equate the troubleshooting efforts of a car and a dead module with something that we normally would say about a family member. And then, as I type this in reply to your question, it occurs to me that you *were* talking ab the loss of his family member- his puppy- and not the car! So I was mixed up in what you were talking ab and it made me laugh for all the wrong reasons. I have towed about 4500# of trailer and granite as well as another couple hundred pounds of granite slabs in the rear for about a 1200 mile trip and the air bags were most appreciated. When I was in Colorado, I towed with the X5 every week. 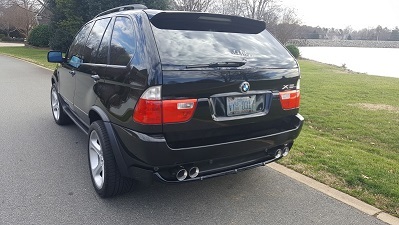 Anything from, mini cooper all the way to other X5, the height control is a plus for sure, as it keeps it level through the entire trip. I towed my 97 M3 from Colorado to Idaho, combine GWR was 11-12K total, and it did just fine. Now I am prepping the X5 to travel back to Colorado Or Texas it all depends... with a Travel Trailer max weight is 4,500lbs so it should be just fine. As for my airbags, they are OE, and I am planning to replace them with ARNOTT brand from Rockauto. They are $97.79 with the same warranty from manufacture, and cheaper somehow . I did do a complete suspension refresh. I just need to do that refresher kit on my wife's X3, and we will be all prepped and ready to go on this road trip of 844-1201 miles depends on the location. I mean really, who needs three of the same model vehicle?